This entry was posted in Important Life Stories on February 15, 2014 by Steve Tilford. 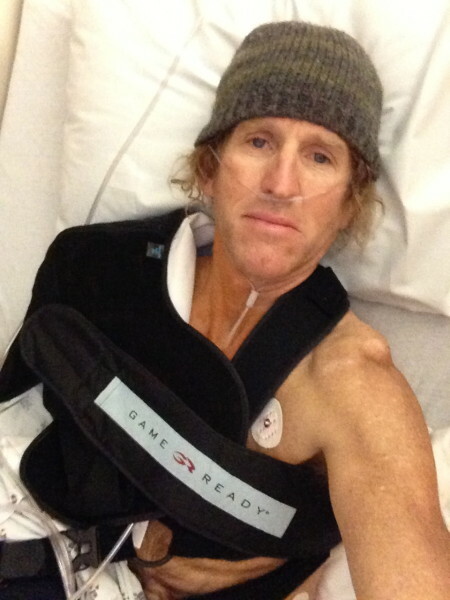 My friend Stacie called a couple days ago and told me it was exactly one year ago that I had surgery on my shoulder, after falling at Cyclocross Nationals in Madison. I guess I knew it was in February last year, but was trying to suppress the whole thing. It is probably not the best time to write something on this because the last week or so, my shoulder has been working pretty badly. I’ve been having some shooting pains going down my arm and reaching out and picking up something, like a cup of coffee, is nearly impossible. But, it wasn’t working up to my expectations ’til then either. Don’t get me wrong, my shoulder works. I can move my arm around, put on a shirt, and do about 50% of things I use it for with no pain. But the other 50% of the time, it is an irritation to a real drag. One of the things I can do fairly well is anything to do with riding bikes. Other than reaching back into my pockets, which wasn’t that easy before I destroyed my shoulder, most of the motions of cycling aren’t painful, thus alright. I was trying to do a lot of personal rehab up until about a month ago. I did a bunch of nordic skiing, then dug a lot of holes in the grounds and did some other things that I thought was strengthening my shoulder, thus not needing the rehab. I’m not sure about that now. The question I ask myself is do I regret the decision to get it fixed? And the answer is, a hesitant, no. The completely torn status meant that the muscles would retract more and thus the chances of repair would have been worse as time went on. One of the rototor cuff muscles/tendons is just hanging there, even now. The guys in Vail couldn’t get it reattached. But it was like that before I torn the rest of it up, so I was hoping to get back to the usability before the accident. That isn’t even close to the case as of yet. I’ve run into a lot of people the last year who have had this surgery. Everyone has a different view of the surgery, and a different recovery rate, but one thing that all agree on is that it is not a fun thing to go through. A friend from San Diego put it best when he said, “I wouldn’t wish it on my worse enemy.” That pretty much sums it up. But is the original repair still intact? You posted so many setbacks over the last year, and the rehab seemed pretty intensive. I had surgery almost exactly three months ago – rotator cuff repair, biceps tenodesis, and Bankart repair – as a result from a fall in a race last year. While I was functional before the surgery, I’m mostly pain free now with much greater range of motion from before the surgery. I’m not fully recovered but I’m so glad I chose to have it done. During the first two months after the surgery I wasn’t so sure though – seemed like I was never going to improve. I agree, I wouldn’t wish it on my worst enemy either. I had very similar surgery with very similar results. Then about a year in, I got talked into doing Bikram Yoga. In three months I had full range of motion and no pain. I beg you to give it a shot for a couple of times a week. Full disclosure: I am not a “yoga person” and stopped doing it after my shoulder felt better and haven’t gone back since. Also, they tend to feel a little “cult-y” to me, so know that going in. All that said, it really worked. I know a sample size of one is not terribly convincing, but what do you have to lose? If nothing else a little warmed up stretching might loosen you up for the season. Good luck! I’m sorry to hear about this so late in the game. And I’m sad this has happened to you. I can sort of relate on the recovery side of things with having broke my neck back in 2002 in that I will always be reminded with bouts of limited movement. I wish you the best recovery and hope your accident and surgical decision don’t have a permanent impact on your great career. I don’t think you’re even close to being done yet. I tore a rotator cuff and it took 2-3 years before it felt normal. I did not have surgery but just took it easy.